Welcome to the Official Home Page of the West Jersey Astronomical Society (formerly known as the Willingboro Astronomical Society). Our club is in its 52nd year of serving both the public and the amateur astronomers of the Delaware Valley. We have a long history of public education, star parties, interesting meetings, in-depth training and experienced leadership. We are a 501(c)(3) tax-exempt organization. Click here for membership information (dues can now be paid through PayPal). Apr 18 Informal Meeting at the Virtua Health and Wellness Center in Moorestown, NJ. Informal meetings in 2019 will continue to be on the third Thursday of the month. As always, guests are welcome and no astronomical experience is necessary. Use the Main Entrance, go straight ahead and follow the sign to the conference center, or check with the security guard who will direct you. Apr 19 Full Moon at 7:12 am EDT in eastern Virgo. Apr 24 Astrophotography Workshop, at Atsion Field, begins promptly at 7:30 pm. Rain/Cloud date, April 25. Observe scope setup, polar alignment, plate solving to target and then image capture. Open to all, members and non-members. Apr 27 Member Star Watch at Atsion. Check back for the weather call on the day of the event. May 3 Formal Meeting, 7:30 pm at the Virtua Health and Wellness Center in Moorestown, NJ. May 4 New Moon at 6:45 pm EDT in Aries. May 4 Public Star Watch at Batsto. Check back for the weather call on the day of the event. May 14 Astrophotography Meeting, 7:00 to 9:00 pm at the Virtua Health and Wellness Center in Moorestown, NJ. There will be a presentation by Dan McCauley - PixInsight Processing Demo of M64 Galaxy. The demo will highlight several important tools in PixInsight including deconvolution, star mask creation and star reduction, as well as LRGB combine. More information and links to practice files available here. Club member Dan McCauley annotated an older image with NGC 3628, the "Hamburger Galaxy" (which is part of the Leo Triplet along with galaxies M65 and M66 under the Lion's hindquarters), to highlight Quasars that surround it. This image is a 10% crop of the original image taken with a QSI-683 CCD camera and a Takahashi TAO-130 apo refractor. Dan obtained his redshift and distance data from the Halton Arp, et al, paper "NGC 3628: Ejection Activity Associated with Quasars." 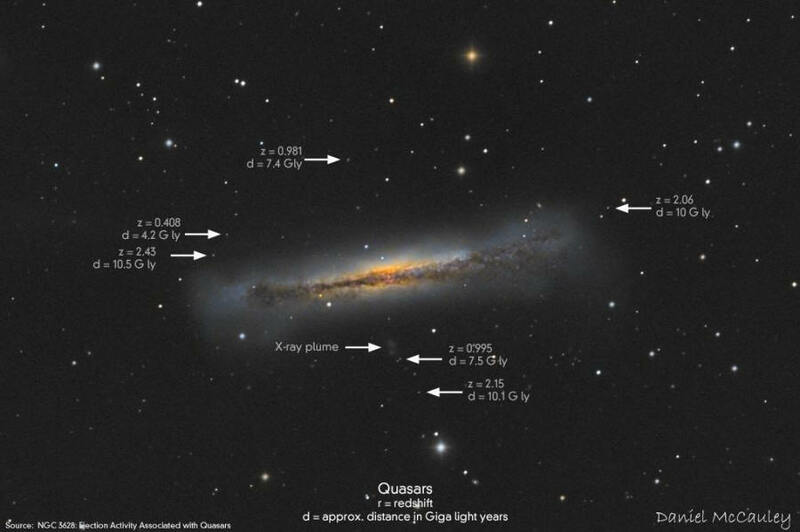 Bob King just posted an online article at Sky & Telescope about observing Quasars. Click here for the previous home page image. Click to contact the . 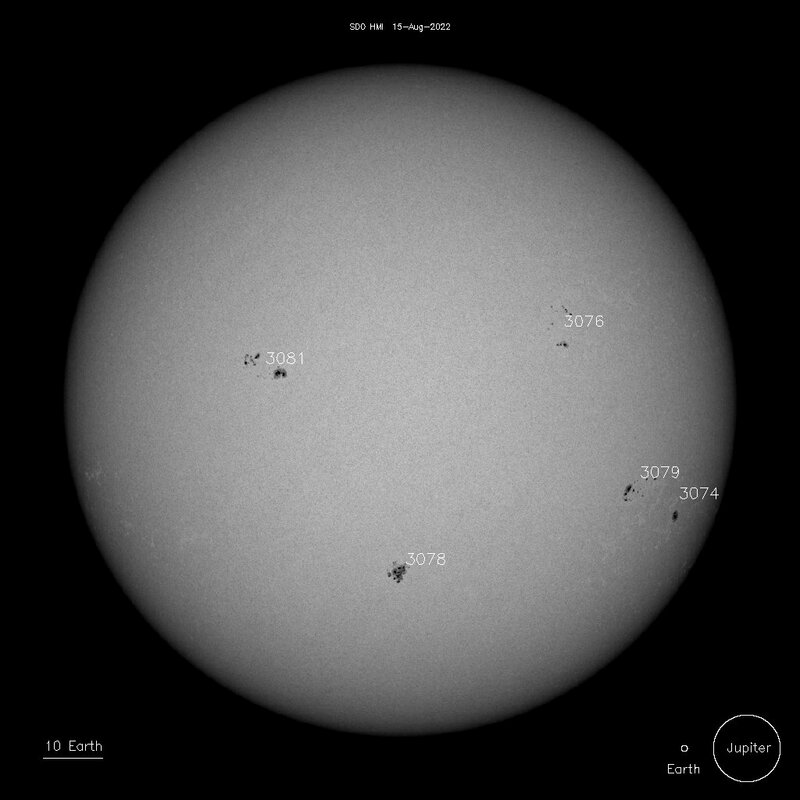 Members are encouraged to submit their astronomical images to the webmaster for inclusion on the WAS Home Page. Be sure to include a description, date and time, as well as equipment and photo data.